The time is here. The big reveal! 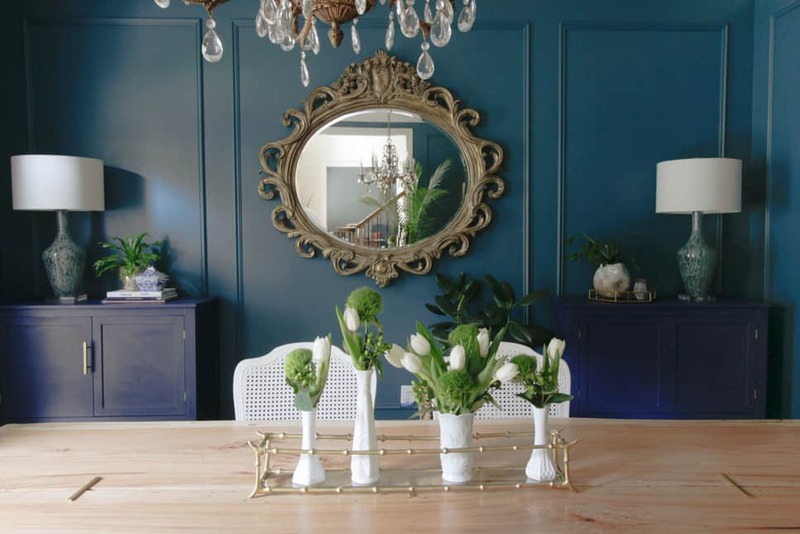 The purpose of this makeover was not to start from scratch. 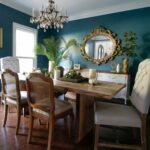 I loved the wall color and I had just built my dream live edge table. But the room still didn’t feel finished, at least in the vision I had created in my mind. And honestly, I was tired of hearing myself say “the room isn’t done yet.” And that my friends, is the purpose of this challenge. To finish a room in six weeks, or in this year’s fall edition, an extended seven. I’m sure it wouldn’t be hard to replicate with a big set for little money! I heard from a friend that www.bedroomfurniturediscounts.com has a fantastic range to choose from. 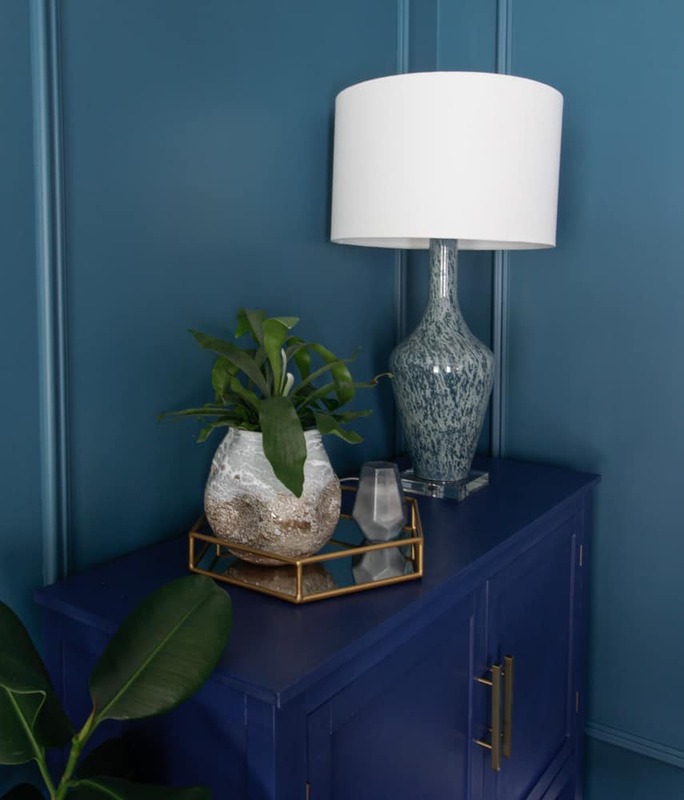 From the beginning of this season’s One Room Challenge, I have said this was not a complete overhaul. I borrowed the term “skinny makeover” from my Instagram pal, Erica Reitman. She made over her main living areas but kept many of her favorite key pieces. Let’s start with the wall color. 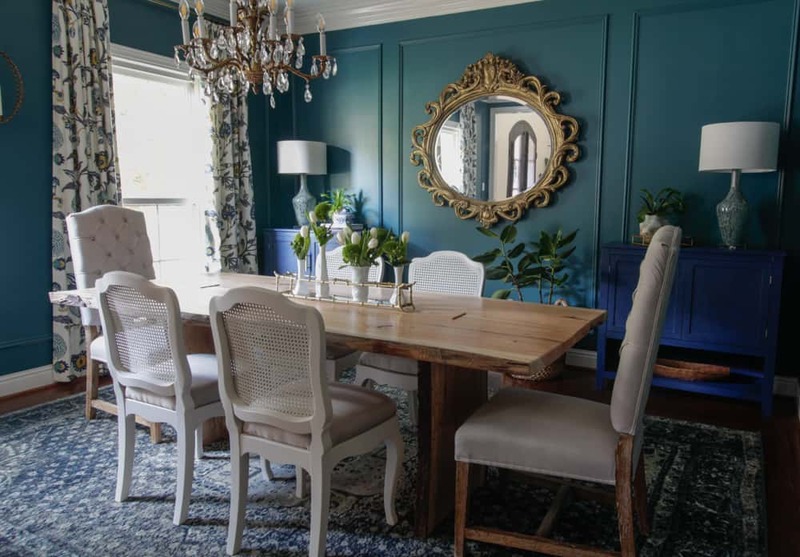 I could easily dismiss i­t­ as a lucky choice, but i­t­ was actually a very deliberate decision at the start of what we affectionately call the #theTrailHouseReno. All other sources are noted and linked at the end. The live edge slab table was a labor of love and a dream come true, thanks to the relentless pursuit of our expanding DIY skills. 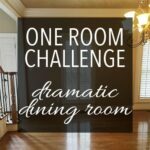 I­t­ was a huge undertaking, certainly not one that could be completed in the short time frame of the One Room Challenge. 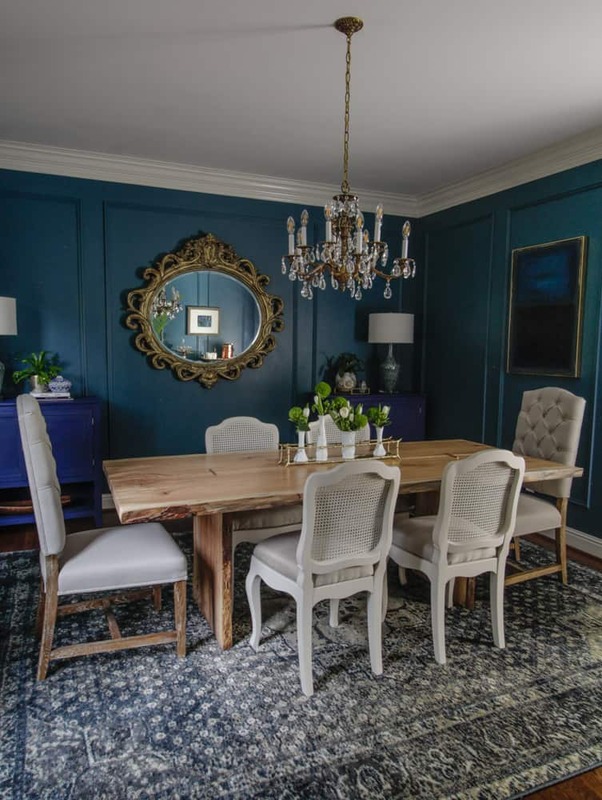 But once it­ was finished, I knew that the room was ready to be taken to the next level and was a perfect candidate for the challenge. 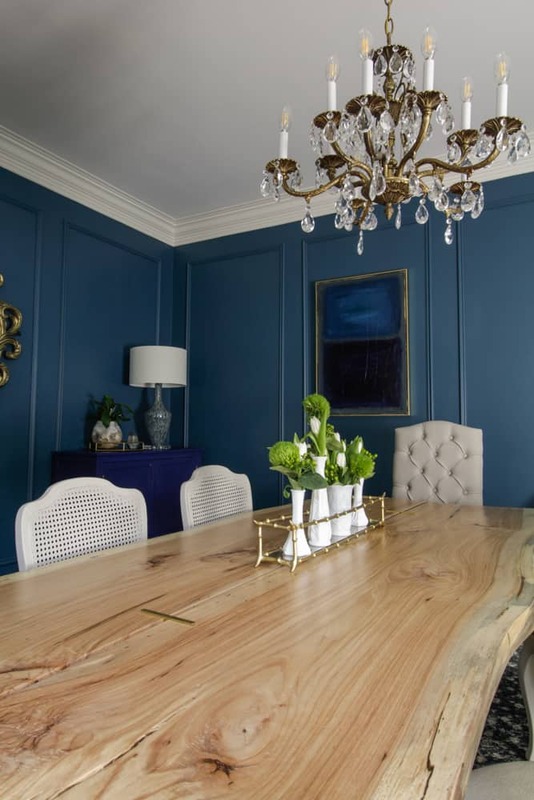 I­t­ was clear to me the room needed to rise up to meet the beauty of the pecan slabs and inlaid brass bars of the table. 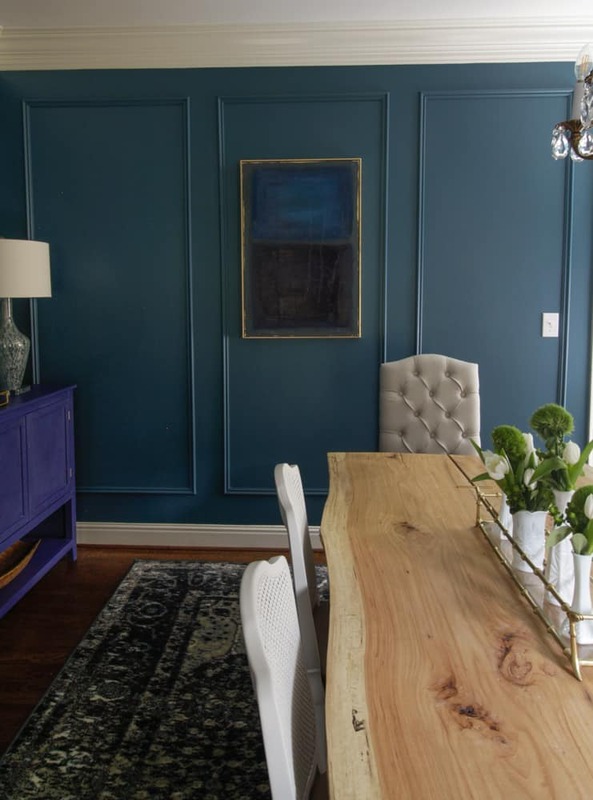 To begin the process of elevating the room, we added panel moulding in large panels. 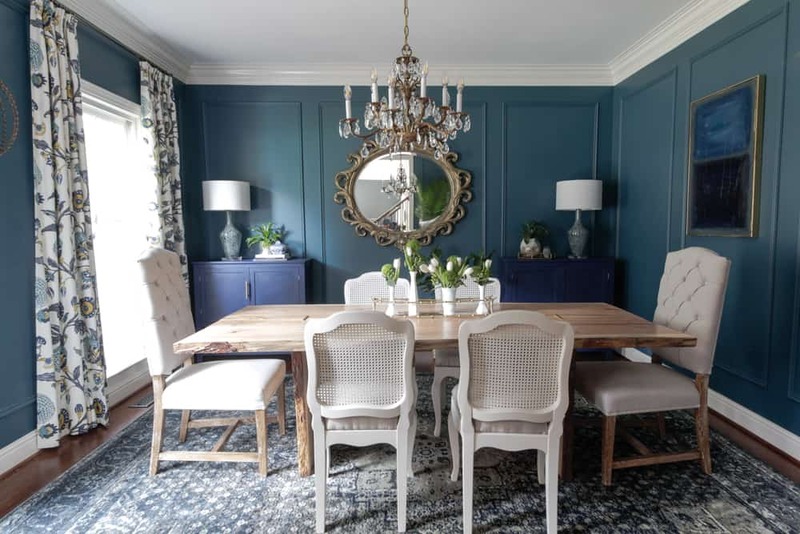 With the goal of highlighting our cherished mirror as the main focal point, we then divided up the other walls accordingly, either to mimic the scale of the dominant back wall or to fit the wall dimensions. 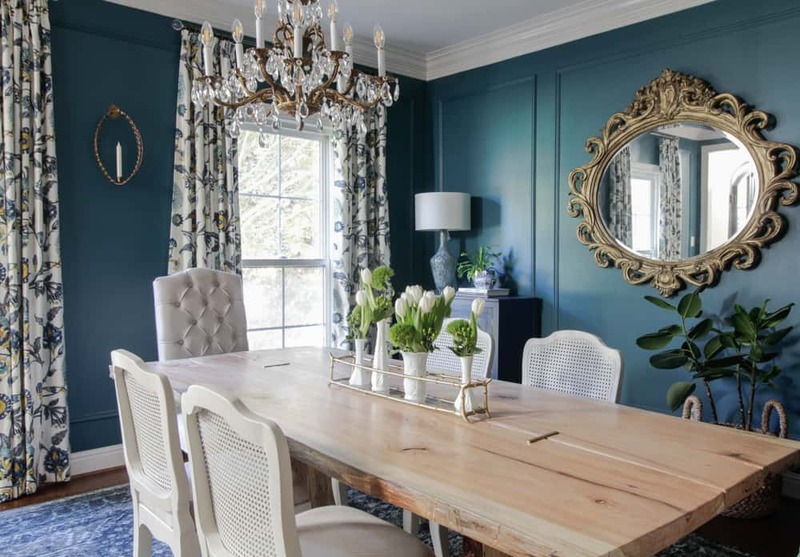 Not only does the ornate mirror contrast the cleaner lines of the table, it­ reminds me of the beauty that can come after a disaster. 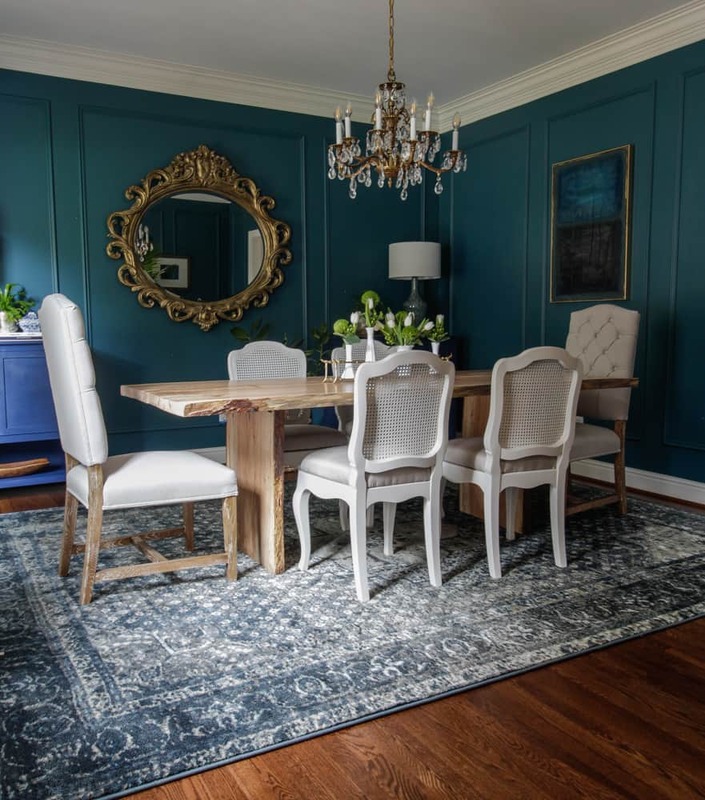 I­t­ was purchased after losing all of our bedroom furniture to hurricane Katrina in 2005 and when we moved to Alabama, I decided to relocate it to a more appreciated space in our home. The dining room. In the original space, I saw the large French buffet as a distraction behind the slab table. I­ also wanted to create a mix and a better balance between shapes and form, a more harmonious blend of clean-lined and ornate furniture. After a misstep in buying thrifted pieces too small in scale for the room and still in need of the storage, I opted for a pair flat box sideboards from All Modern. 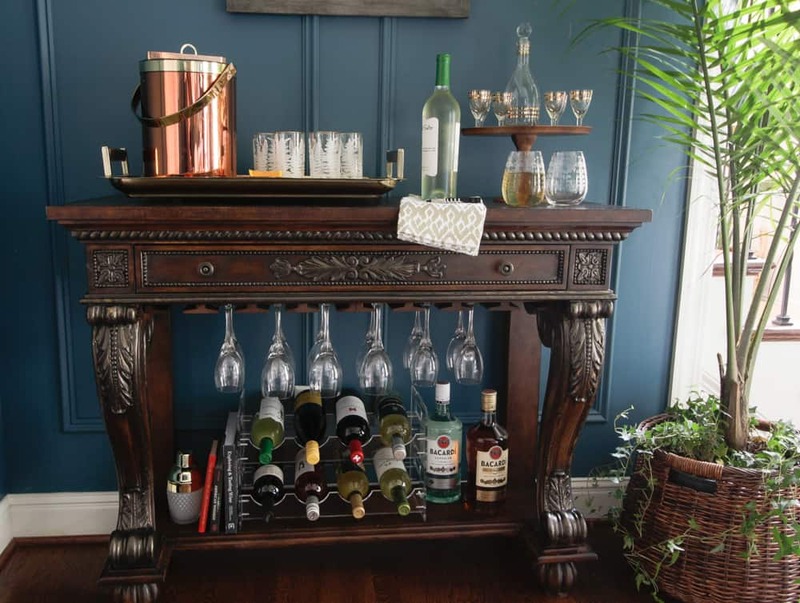 As expected they took a bit of patience to assemble, but the need for a pair of chests in a certain size, in short timeline that hit the right price range made it­ worth the effort. 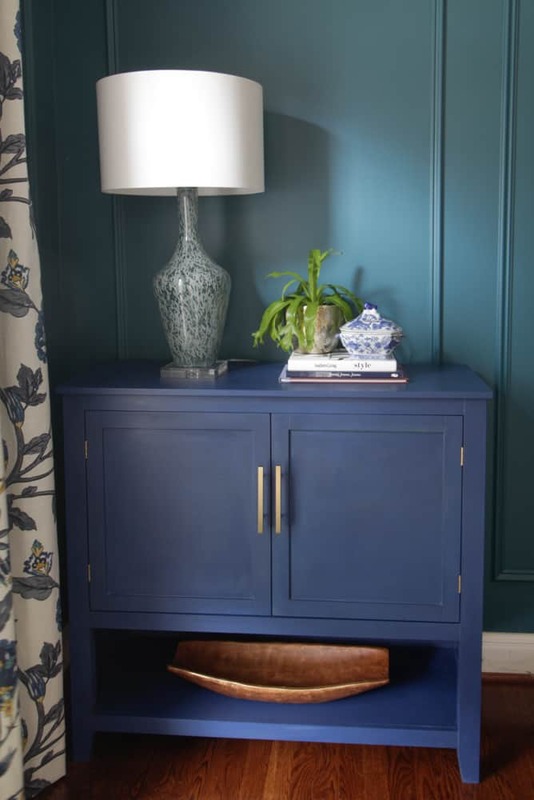 To customize the plain black boxes I gave them several bold coats of Napoleonic Blue from Annie Sloan Chalk Paint and Waxes. Adding long, elegant champagne bronze pulls further elevated these practical pieces. As much as I am drawn to the curves and details of traditional furniture, I also love the modern organic nature of a slab table. I hoped to create an unconventional mix that speaks to both sides of my dynamic style. 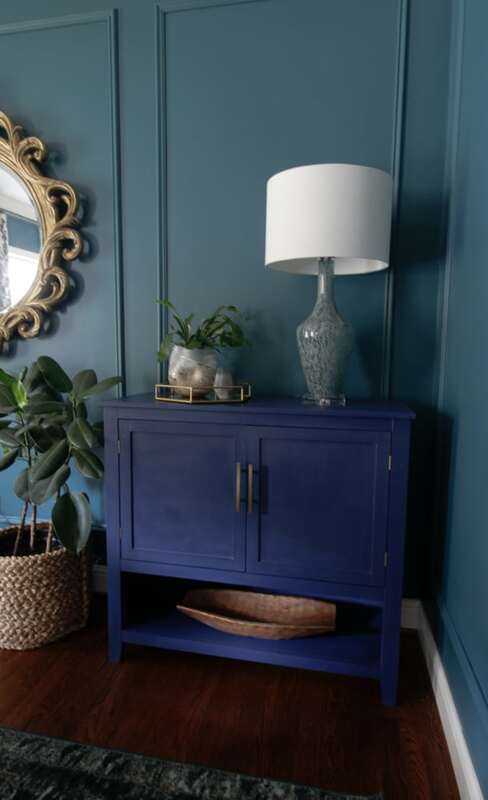 For the last element to complete the room, I looked to the one piece of furniture I felt wasn’t functioning well in my home but could not part with. I­ had an entry table, a gift my husband gave me for my birthday years ago. I­n this house the table didn’t fit on the most obvious wall the way I liked and in a feng shui kind of way stopped your eyes from flowing into the house. 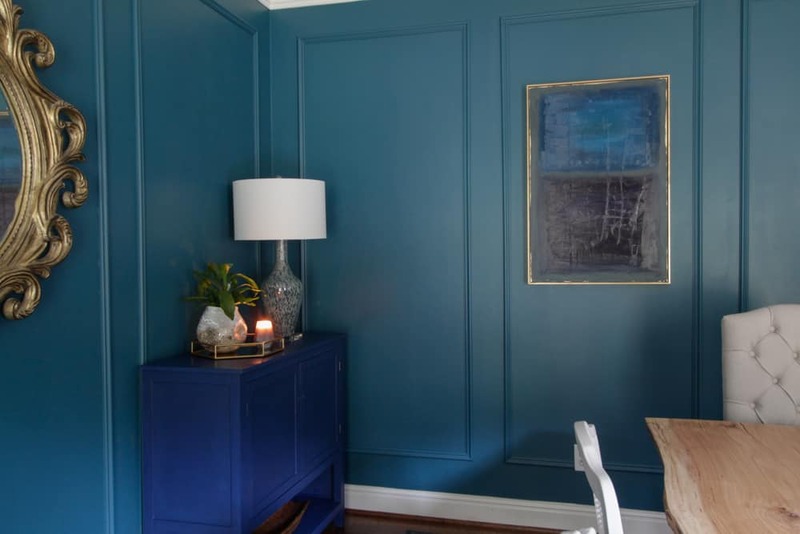 As luck would have it, this entry table filled this opposing stairwell wall in the dining room perfectly. 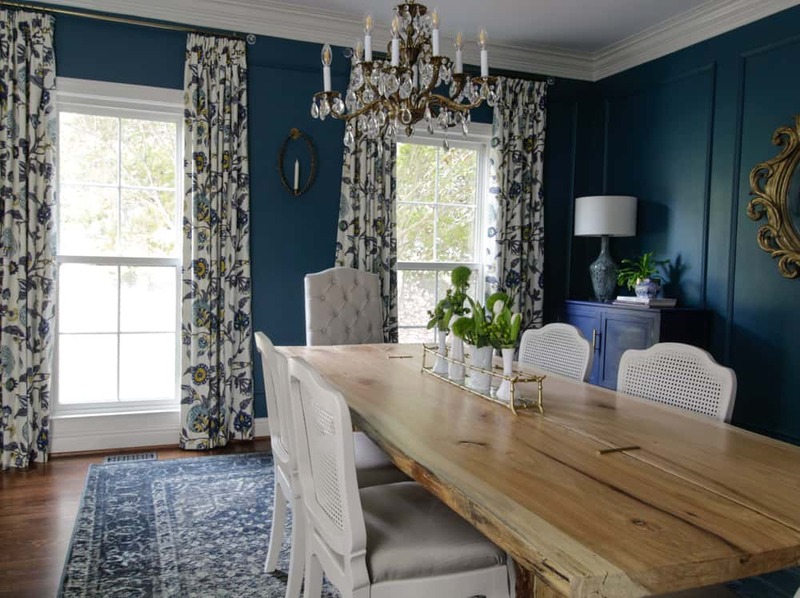 Then, it­ was just a matter of giving it­ purpose in the dining room. A wine bar seemed like an obvious choice. To gain space in my kitchen cabinets I mounted wooden wine glass holders to the base of the table. 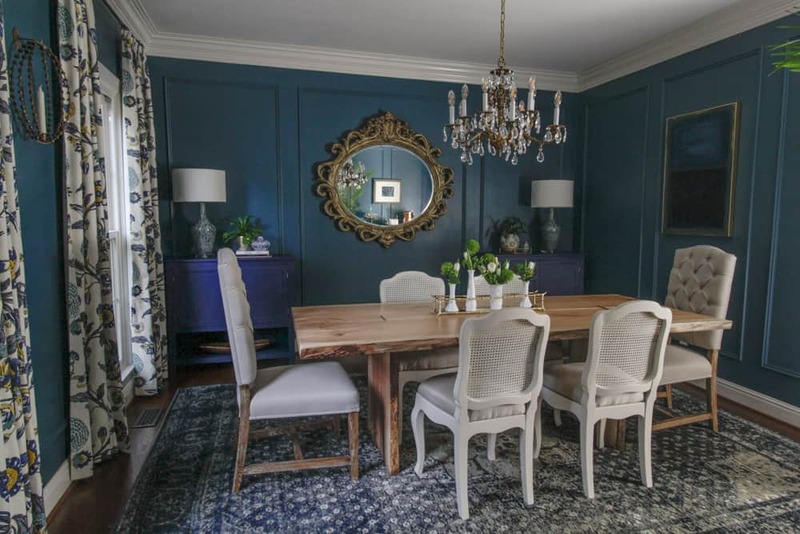 All it­ took was removing the ornate ironwork that had lost favor with me over the years. I also toned down the gold leafing with black glaze and added a fresh coat of black wax to protect the leather top. Wine bottles can now be stored on the bottom shelf for impromptu parties and the whole set up provides more space for beverage prep during gatherings and the holidays. The two windows in the room face east, providing the strongest light in the late morning. While the windows are generous, the available light is filtered greatly by an oversized maple that turns a beautiful crimson color before losing its leaves in the winter. 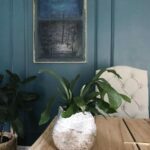 The best way I knew to turn this negative, the absence of bright light, into something positive was to create a dramatic room with a bold shade of teal. 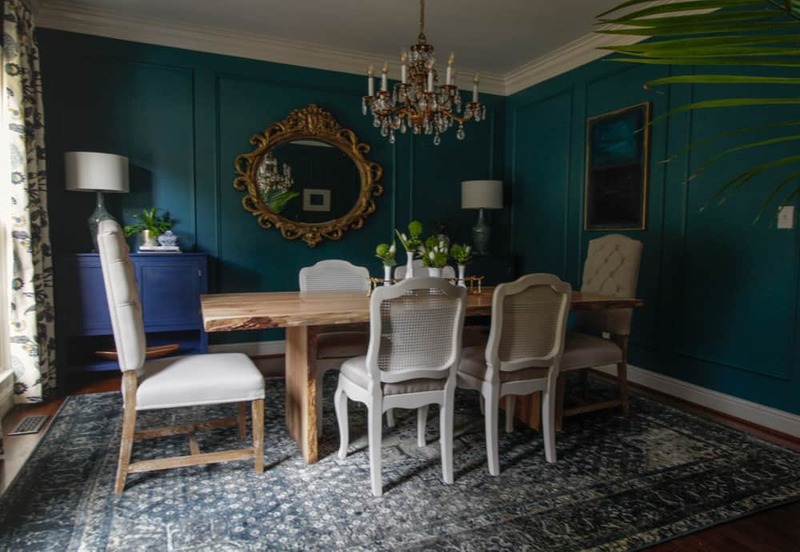 To contrast the dramatic wall color, Deep Sea Dive by Sherwin Williams, I chose a bold fabric from Dwell Studio and Calico Fabrics. 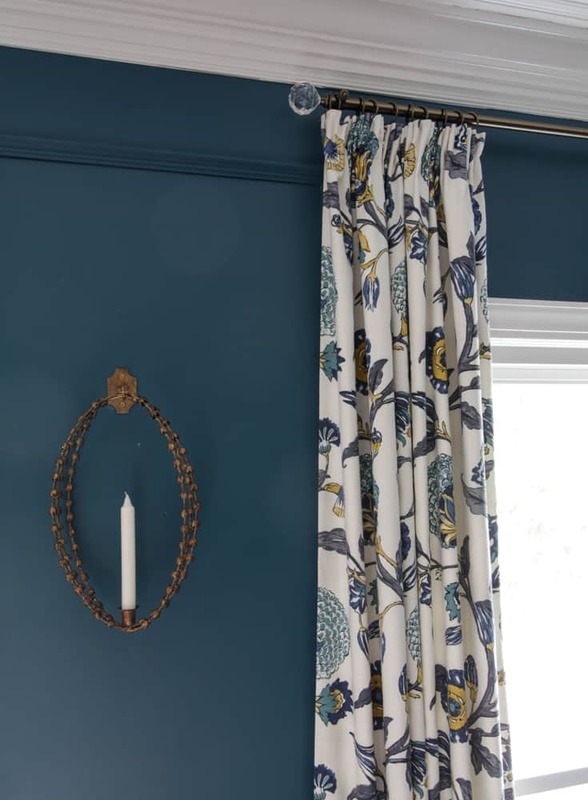 I designed them with a simple pencil pleat and hung them on antique brass rods with faceted glass finials. 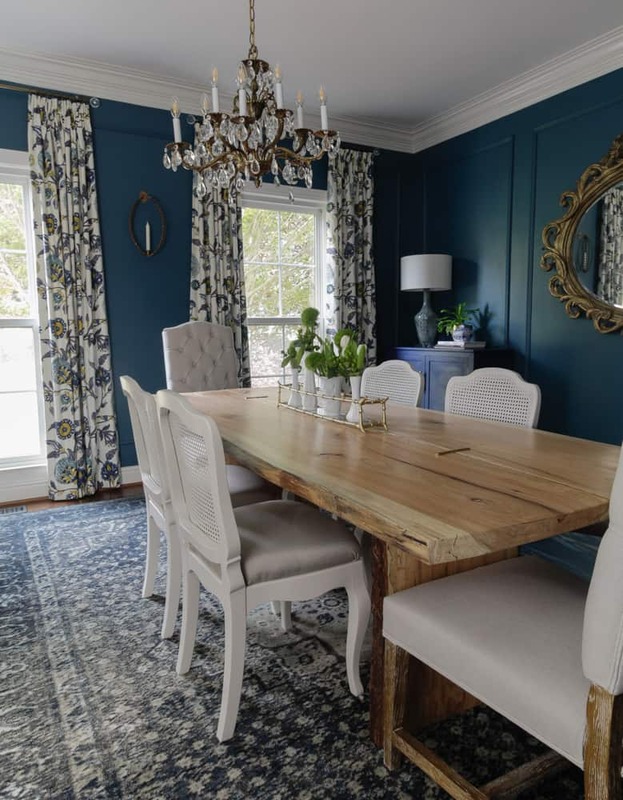 Lastly, a deep-toned rug was selected for the sole purpose of providing a contrasting foreground for the live edge table. Can you tell I wanted it­ to be the star of the room? Further proof of muted choices is the selection of a pair of low contrast lamps to sit atop the sideboard as well. 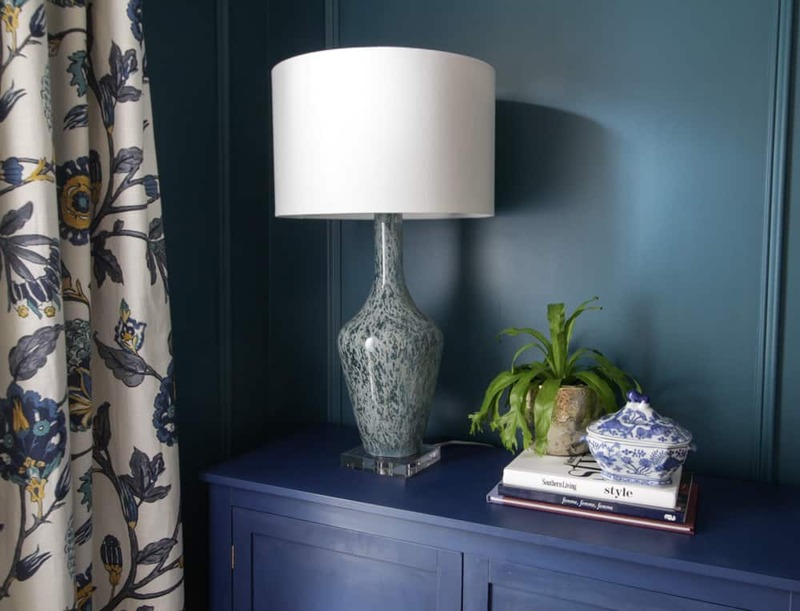 I debated at length over these lamps or a beautiful pair of cream colored gourd lamps but I felt like almost white option became too dominant in the room and decided instead to go with the subtler choice. 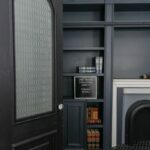 Just as much as any other room I designed, the numerous DIY projects that moved from vision into reality make me extremely proud of the way this deep, dark moody room has unfolded. 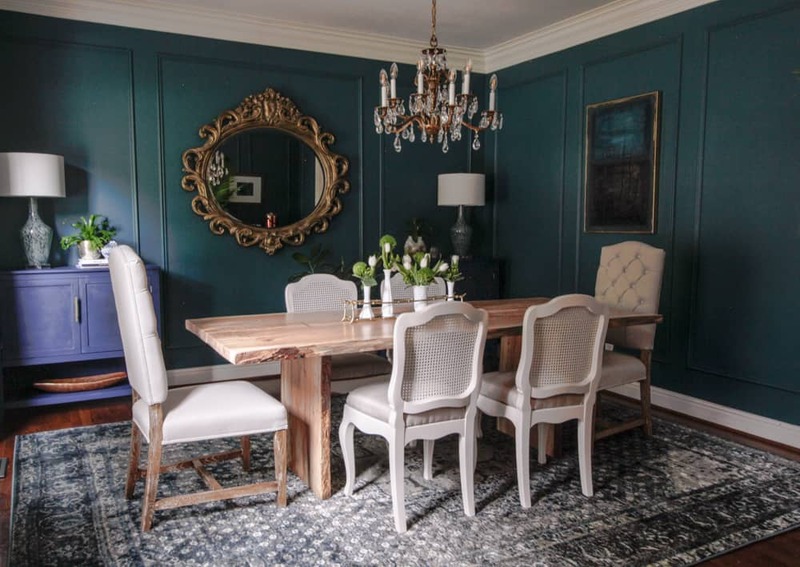 Throughout the challenge, some on social media suggested perhaps I compromised design for the reality of my budget in keeping the French cane chairs, but I much prefer a room that is more collected looking rather than perfect. The end result feels like a home, not a room designed for accolades but for living and living well. 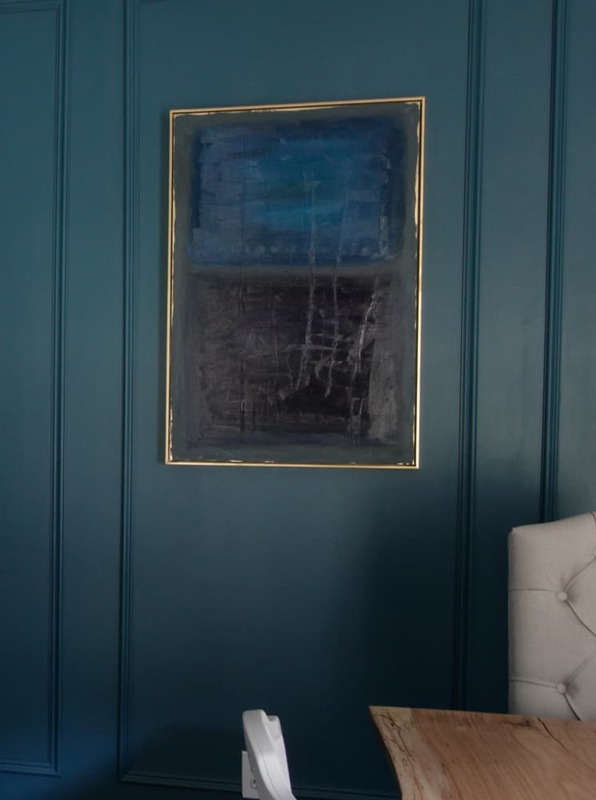 The last fun little DIY was this Mark Rothko inspired art. It was so good to get my paints out and just create. 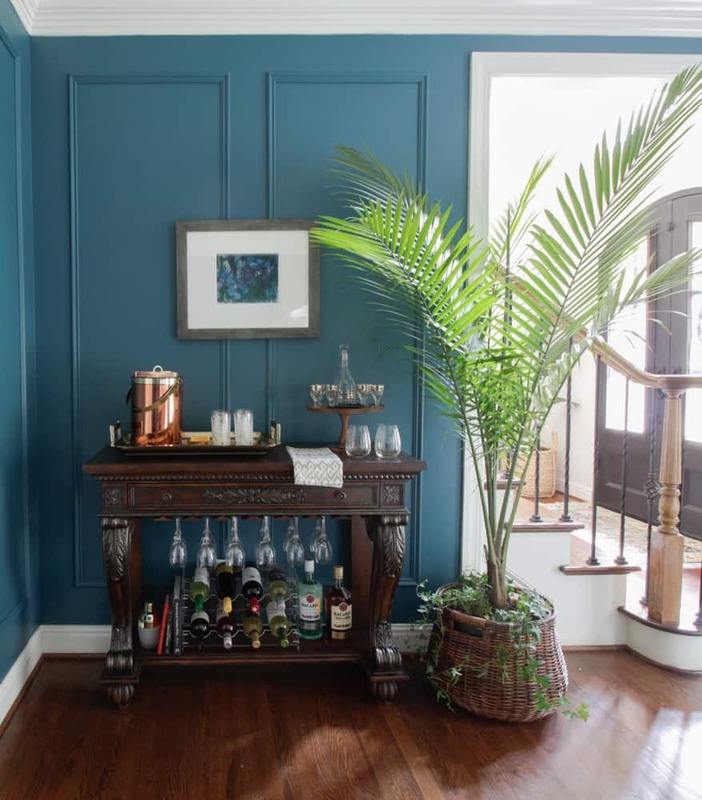 His blocks of deep shaded colors were the perfect modern inspiration to pair with the traditional elements of the room. As I photographed the reveal, I had to keep reminding myself to not overexpose the room. It is indeed a dark and moody room. It was hard to balance capturing the room as it is experienced in th room with how it photographs. My strongest desire was to capture the reality of the room. Compare the photo above with the two below. They are both beautiful, but the one above is a reality. The one below has added lights sources. To give you an appreciation of how far this room has come in the last 7 weeks, here is a look at the room before this final “skinny” makeover. Clearly, it was off to a good start from where it began just a year and a half ago. In a way I am thankful my budget constraints forced me to take my time in this room and let it evolve. 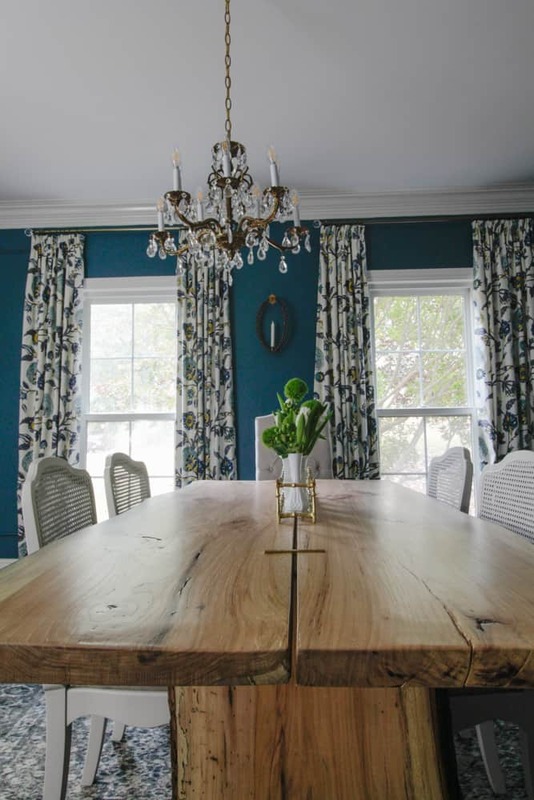 The extra time upfront allowed me to go slower and be more deliberate with my choices, to ponder the attainable possibilities and gave me the ability to execute more involved DIY projects like the live edge slab table. Full tutorials are coming. Be sure to follow me on Instagram to not miss the post! I can’t even begin to give an estimate of how many hours were invested into transforming 4 rough cut slabs of pecan into the table you see here. It was certainly not a project that could have been completed during an event like the One Room Challenge. I hope you were inspired by the possibilities I tried to share with this reveal. I cannot wait to fully experience this room during the holidays with the people I love most. That is my most important goal in creating any public space in my home. Of course, I want to thank Linda from Calling it Home for this event and for the media sponsors, House Beautiful. I also would like to thank Metrie Mouldings for their support of this project. I can’t wait to have an opportunity to pour over all of the Participant’s reveals! From what I have seen these rooms are completely amazing! You can see them here. Be sure to settle in for a great inspirational ride into the Guest Participants posts here. Among them are some of the most talented, hardworking bloggers who out of a passion for their craft participate in this grueling yet rewarding event. Did you know that ORC Selection team reviews each project and chooses 2 guest participants to be added to the list of Participants for the next season? You know that’s my dream, right? And the opportunity to have your work in front of the editors of House Beautiful is pretty sweet! This year, one more possibility for media exposure has been added. The talented and successful husband/wife blogging team @homelove have created HomeLove Network will also be reviewing the entries for an opportunity to be featured. GO check out their channel here. I think you’ll love it! I appreciate the dark and moody for dining rooms. 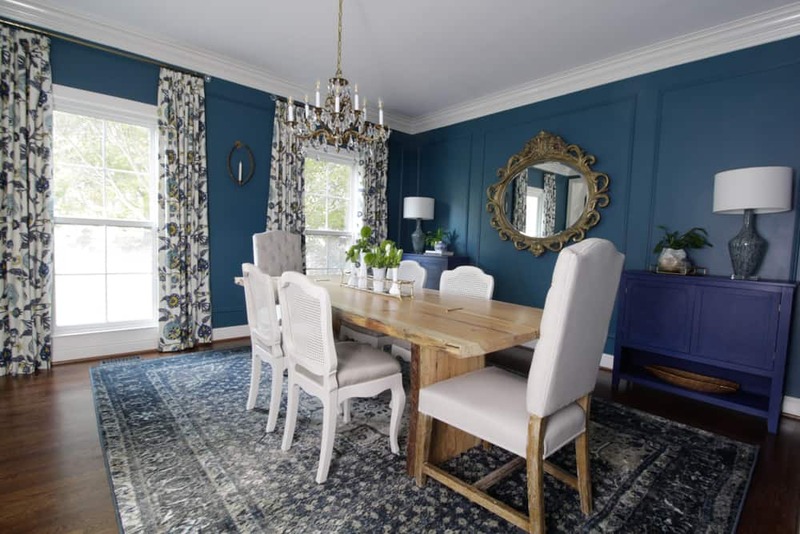 I bet the color helps lead to lots of lingering conversation over meals! 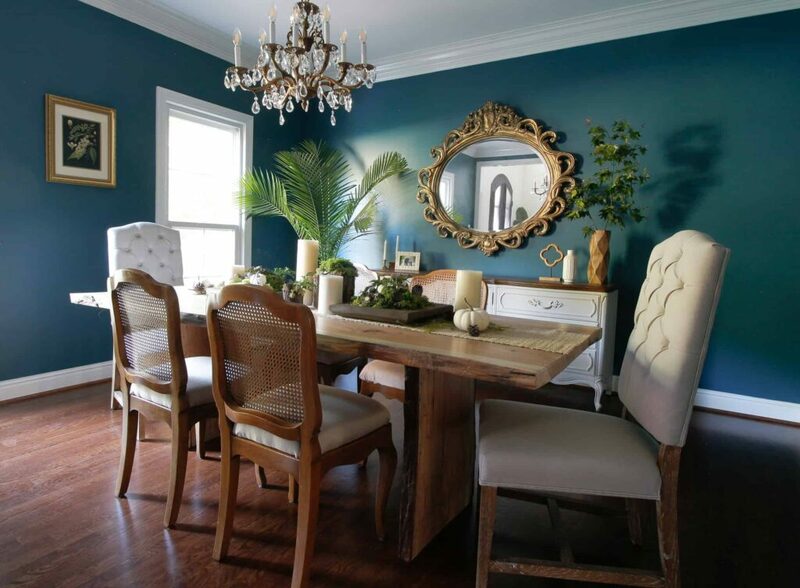 It looks well collected with the things you love, great for a family dining room. That deep blue is gorgeous! Enjoy your space it is beautiful! 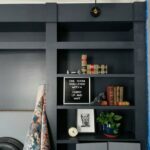 I love your finished room and have enjoyed following along and getting to know you and your puppy a little bit! 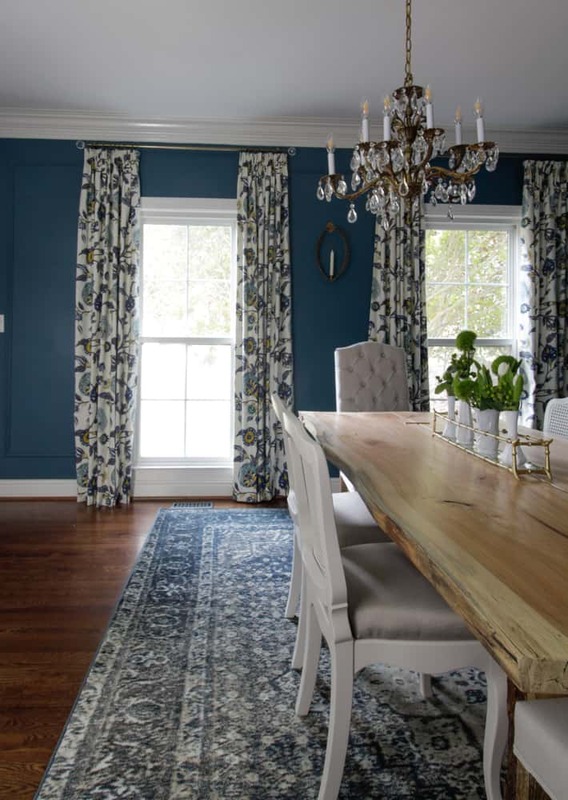 Your gorgeous table is definitely the star but it is complimented beautifully with your drapes, rug and original art. 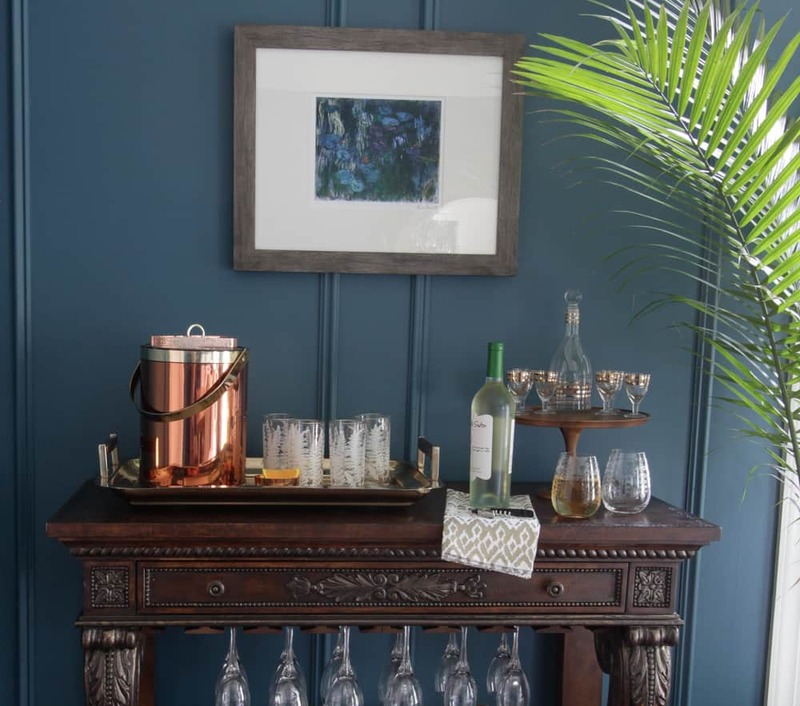 I personally like every the mix of chairs and think they tie in with the mirror and bar cart wonderfully to balance out the more modern/sleek elements. All in all, ? ? ? ? 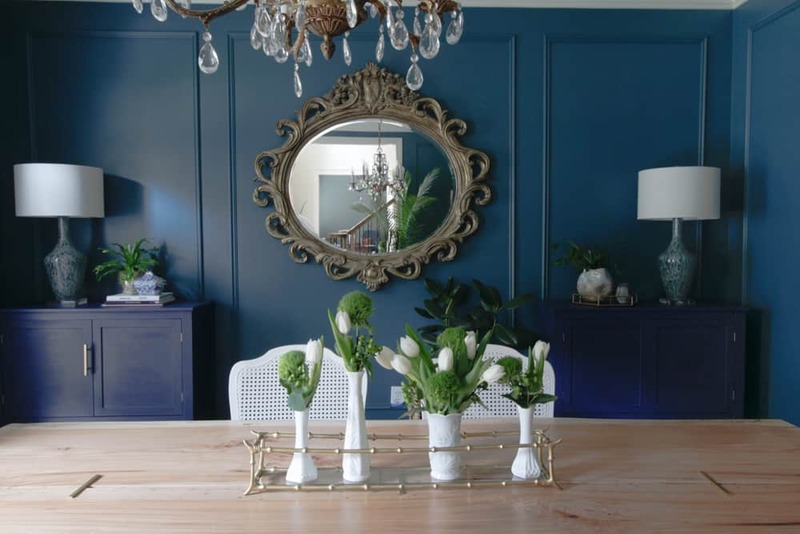 LOVE the mixes of blue here! 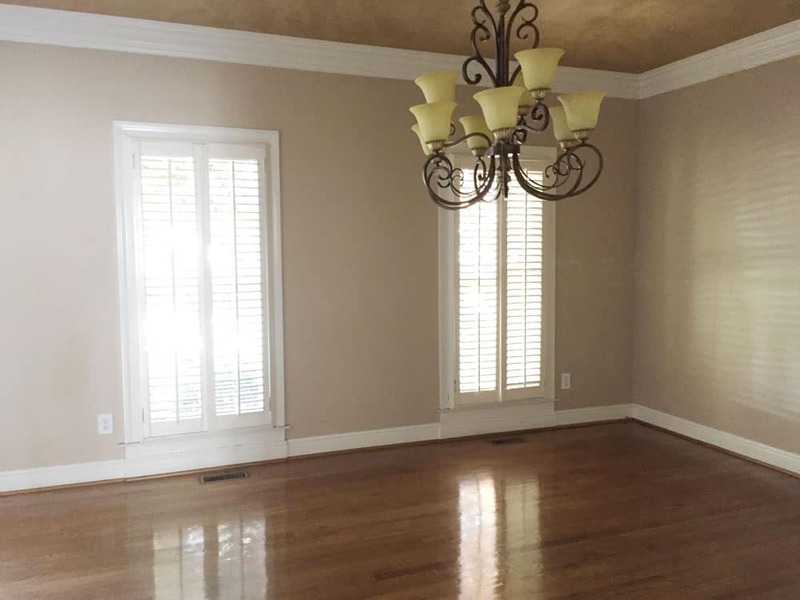 Is the light fixture an antique or do you have a source for it? The room is beautiful. It is an antique. I thought about replacing it with a modern fixture but we have sentimental attachment to this one. I bought it from a sweet old man when we lived in Missouri. I do see plenty this style on eBay or in local antique malls. I was wondering if you were still going to do a how-to for the table or did I miss it.